And just like that, I became a Whovian. Pregnant with kid #2 and home on bed rest in 2013, I stumbled on a TV show called Doctor Who on BBC America. I had recently heard rumblings of the show in reference to my other pop culture fandom (Disney) so I decided to watch an episode, which happened to feature the 11th Doctor. I immediately went back and started at series 5, where the 11th Doctor was introduced and fell head first into Doctor Who fandom. Note for Doctor Who fans-to-be: Check out this video from the BBC when they launched on the BBCA to learn a little Doctor Who 101, or read this: Tardistopia, Who is the Doctor? So what does all of this have to do with Hendricks County tourism? It wasn&apos;t long before I saw a Facebook ad for a local open house featuring a Doctor Who merchandise event at Who North America. It was there that I met Keith and Jany Bradbury for the first time, and discovered how they turned their passion for a TV show into a business. 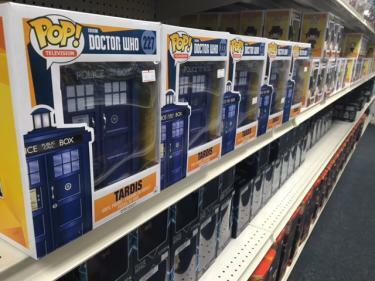 Well, you can only imagine my excitement when they moved Who North America into a free-standing storefront in Hendricks County March 1 as the only Doctor Who specialty retail store in the United States. Who North America (WHONA) opened in Camby at 8901 S. Ind. 67 (Kentucky Ave.) in the former Vincent Furs store and is still a work in progress. Open 11 a.m.-6 p.m., Tuesday through Thursday (6-8 p.m. by appointment only) and 11 a.m.-8 p.m. Friday and Saturday, the Bradburys have big plans for this new store. After being in business the last 18 years, they were thrilled to open up a retail home shop after building a very loyal customer base over the years at various Doctor Who and toy conventions including locally held Indy PopCon, Indiana Comic-Con and of course, GenCon. I must say, this place was like stepping into a little corner of the Doctor Who world. Everywhere you turned there was something new to see including the new Funko Pop line (I brought home a Cyberman! ), T-shirts and clothing items, board games, books, magazines, CDs, jammie dodgers, jelly babies and so much more! 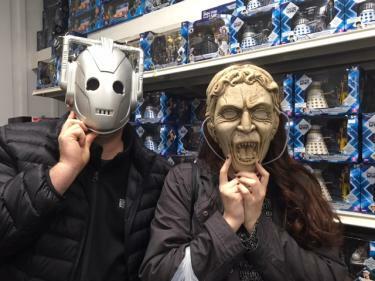 Jany and Keith started WHONA for Doctor Who fans, as they too are fans of the show. They set out to make Doctor Who collectibles accessible and affordable to fans, and they&apos;ve done a great job of making that happen. The 2,000-3,000 square feet of retail space is completed. They will soon finish up another 2,000-square-feet of museum space which is to the right when you enter the store. In that area you will find character cut outs, rare toys and collectibles on display, as well as special props from the show over the years. Around the corner you will find the arcade which includes an original 1970&apos;s Doctor Who pinball machine on free play so any visitor can try their hand at shooting the sonic screwdriver. Up next will be the installation of the viewing room, which is being relocated from their old warehouse and will be set up in one of the original Vincent Furs vaults. The room will allow visitors to watch Doctor Who episodes in full surround sound and even in 3D. In the back, there will be a multi-purpose room coming this fall where they will host various events and workshops including costuming/cosplay workshops, game nights including LARP activities and eventually be available for guests to rent for special events. Be sure to plan a visit on your next trip to the area -- especially if you have a Doctor Who fan in your house. I promise it will not disappoint. You can&apos;t miss the big sign along the road and eventually the entire exterior of the building will be painted Tardis blue! The owners also are planning a grand opening later this summer with fun activities so keep watching our Events Calendar for more information about that event. Jaime is the Executive Director of Visit Hendricks County. She serves in many community leadership roles and resides in Pittsboro with her husband Scott, son Connor and daughter Paige and spends way too much time at the Shops at Perry Crossing in Plainfield. Follow her on Twitter @jbosmith.